I forget where I found this old card but it was meant for me. 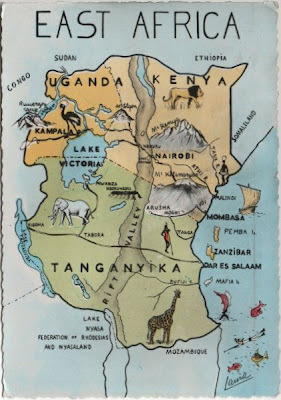 My father worked in Nyasaland (now Malawi) for a time, just to the south of the area shown, and of course I can't resist a new map card. Tanganyika is now known as Tanzania. It's dated 8 November 1966 and was sent from "Daddy" to Nicholas with some lower value stamps. Nicholas must have steamed the stamps off because all that is left are patches of gum. There is also a message for Mummy, thanking her for her letter of 4th, "received yesterday". Three days? That's amazing. This is such an interesting card as it has historical content due to the name change. It is so interesting how names change in other countries. An old globe wouldn't be accurate anymore. What a find! I love this although it does make me pine somewhat for Africa. Then again, I've been doing a lot of that lately.